Do you remember how, maybe around ten years ago, writers like Nick Hornby and Chuck Palahniuk were really cool? You’d read something like Bret Easton Ellis’s American Psycho or Don DeLillo’s Cosmopolis and go, Wow, that’s brilliant! And do you know how now, when you try to pick up one of those writers again, you’re too jaded by movie adaptations trying to make hard-line masculinity and sexual violence seem edgy to really appreciate what the writers were trying to say about urban culture and the weird bonds that form between people and what happens when you’re no longer young and suddenly running out of opportunities to make a fresh start? Have you ever thought it would be kind of awesome to re-experience the excitement of those stories without the nagging annoyance of an ever-present undercurrent of misogyny? If so, then you need to read Parade. It’s by far the most enjoyable novel I’ve encountered this year. When I first sat down with it, I thought I would read twenty pages and then call it a day; but then, the next thing I knew, I was ninety pages in and terrified that I wouldn’t be able to stop. 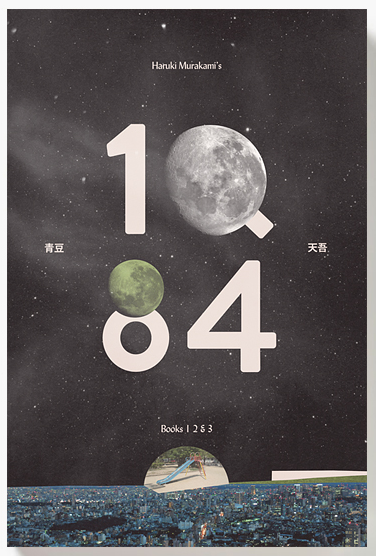 The novel’s five chapters are recounted by five different characters, each of whom is crazier than the last. I loved all of them, and I had to pace my progress through the book so that I could spend more time in their presence. 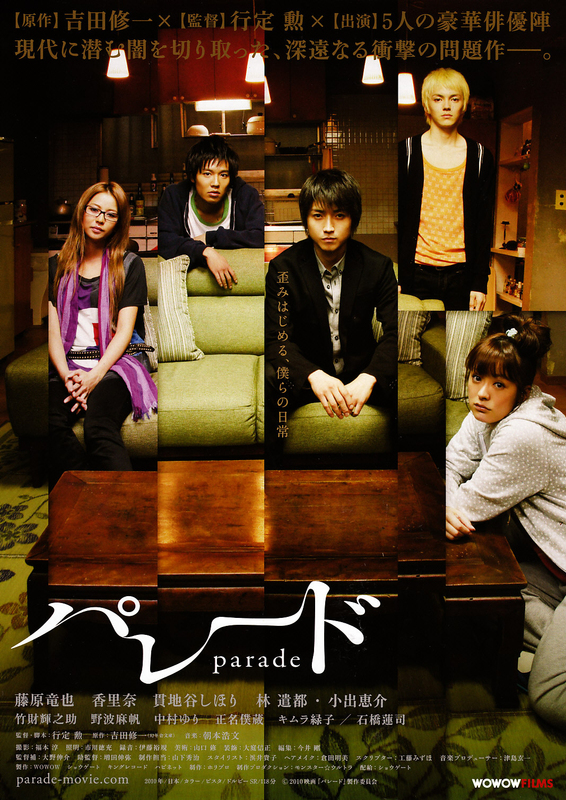 Like its narrators, Parade is young, and it’s fun, and it’s clever, and it’s psychologically unbalanced (in a good way). The story is about four people in their twenties who have no idea what they’re doing with their lives. Almost by accident, they’ve found themselves living together in a two-bedroom apartment, where they’ve established an easy and comfortable social space that one of them likens to an internet chat room. In short, each of them is free to be as dysfunctional as he or she wishes without incurring the judgment of the others, and they get along well. Sugimoto Ryōsuke is a sophomore in college who adores a protective upperclassman and has found himself in a Sedgwickian love triangle with his friend’s girlfriend. When he’s not stalking this girl (with her tacit approval), he’s aimlessly driving around Tokyo in a derelict Nissan March that he’s named Momoko. Ōkochi Kotomi is twenty-three, unemployed, and may or may not be dating an up-and-coming young actor. She spends all day inside the apartment watching tv and waiting for her maybe-boyfriend to call. Sōma Mirai is only a year older than Kotomi but manages a branch of a boutique that sells clothes and accessories imported from places like India and Bali. She’s also an unrepentant alcoholic who frequents gay bars and stays up all night working on digital illustrations based on close-up photographs of male bodies. Ihara Naoki, the apartment’s last remaining original tenant, is pushing thirty and seems the most normal of the group. He works at a small but successful film licensing company and goes on jogs late in the evening while listening to classical music. Every so often Naoki’s nutty ex-girlfriend Misaki appears without warning, has a few drinks, and spends the night on the apartment couch. One night, Mirai picks up an eighteen-year-old high school dropout named Kokubo Satoru on one of her pub crawls through Shinjuku. Satoru, who does speed in public restrooms and trolls for clients in parks, has no fixed residence and somehow ends up squatting in the shared apartment. His entry into the lives of the four tenants coincides with a string of assaults in the neighborhood that become increasingly violent over the course of the novel. Meanwhile, the unit next door – Apartment 402 – is fairly obviously serving as the headquarters for some sort of shady operation orbited by creepy old men and weeping teenage girls. Despite all this, Ryōsuke, Kotomi, Mirai, Naoki, and even Satoru continue to drift through life largely untroubled by anything that happens outside the confines of their apartment. For the reader, there is a certain Gothic appeal in unearthing the secrets hidden under the placid comradery characterizing this pseudo-family, but the lack of concern on the part of the people in question drains most of the shock from each revelation. So Ryōsuke is stalking his older male buddy’s girlfriend because he has a weird father complex? It happens. Kotomi is obsessed with an actor not because of lust or emotional emptiness but because of a half-hearted sense of guilt over something that happened when she was a high school student? Whatever, it’s no big deal. By the time the reader uncovers the more sordid secrets of Parade‘s narrators, they’re become more amusing than upsetting; and, if nothing else, knowledge of these secrets only serves to render the continued companionship of the apartment’s tenants all the more touching. I understand how some people might interpret Parade as a horror story, but it’s really more like an American sitcom about comically mismatched roommates. “Comically mismatched” happens to mean “weaving in and out of the borderlands of sanity” in this case, but the novel still has the potential to generate a lot of warm fuzzy feelings, at least in readers with a healthy tolerance for black humor and antisocial behavior. Philip Gabriel’s translation is eminently readable, capturing the grit and immediacy of the narrators’ different styles without resorting to easily dated slang or stereotypes regarding urban speech patterns. Yoshida is a popular writer with a distinctive literary voice, which I feel comes across much more clearly in Parade than in Gabriel’s earlier translation of the author’s 2007 novel Villain. That being said, both books are a lot of fun, and I’m looking forward to more of Yoshida’s work appearing in English. Isao Yukisada, who won a Japanese Academy Prize for his 2005 adaptation of Katayama Kyōichi’s bestselling romance Socrates in Love, directed a movie version of Parade. The film was well-received at the 2010 Berlin International Film Festival, winning a FIPRESCI Award and going on to screenings at festivals all over Europe and North America. I had a chance to catch the movie at a showing during that year’s Philadelphia Film Festival, and it was really good. I highly recommend Yoshida’s original novel, of course; but, if you get an opportunity to see Isao’s cinematic adaptation, go for it! 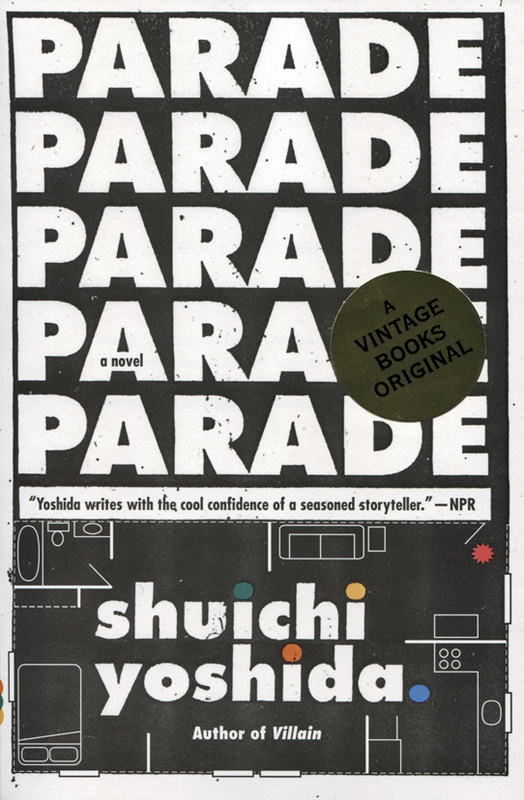 A review copy of Parade was kindly provided by Vintage Books.